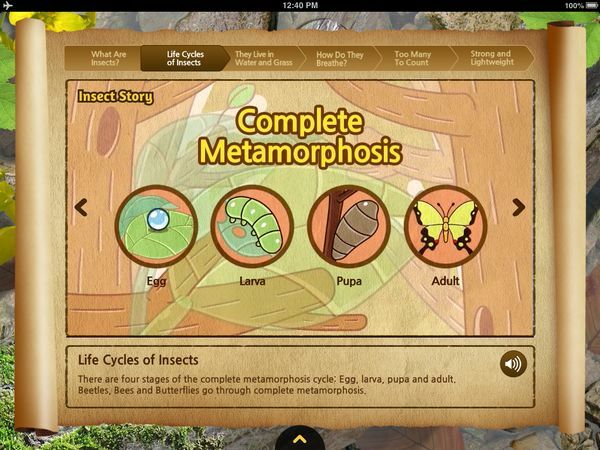 More than seven months ago, I reviewed a high quality science iPad app for elementary-level students who want to explore the world of insects entitled Meet the Insects: Forest Edition. 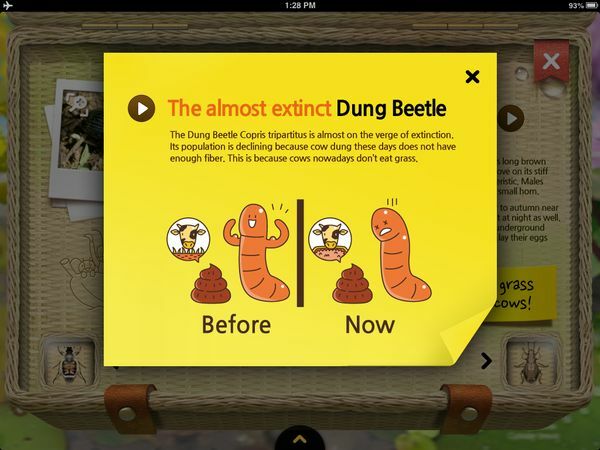 It turned out to become the first edition of a series of encyclopedia apps under the Meet the Insects brand. The second edition, Village Edition, was released back in January, exposing the insects who are living around our homes. Both apps were created based on the facts provided by the National Science Museum of Korea. Today, we witness the release of the third (and final) edition of the trilogy, Meet the Insects: Water and Grass Edition. The brand new app makes the series a complete one by focusing on the insects who are living near the water and in grasslands. 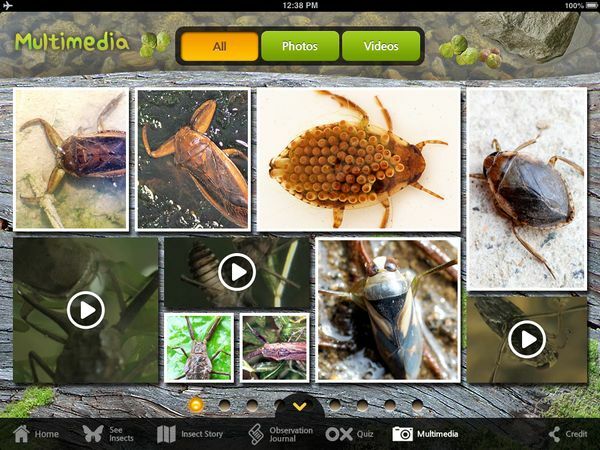 Meet the Insects: Water and Grass Edition is the third app in the comprehensive Meet the Insects series. This edition has all the basic features that are included in the first two editions, such as Insect Story, Multimedia, Quiz, and Observation Journal. If this is your first time trying out the Meet the Insects series, I’d recommend you to start by watching the interactive story of insects in the Insect Story section. It provides basic information on insects and their life cycles, including the differences between the two types of metamorphosis that insects experience through their lifetimes. The Water and Grass Edition differs slightly in terms of content as it highlights insects that live near the water, in the water, and in the grasslands. You will learn how insects breathe underwater, how the compound eyes of a dragonfly works, and why beehives have hexagonal shapes. The videos are beautifully designed and well-suited for self-learning purposes. Once you have finished watching the Insect Story video, you can start browsing the gallery of photos, videos, and interesting facts. The items here are arranged in the order of their subclasses: Hemiptera, Coleoptera, Odonata, Hymenoptera, and Mantodea. You can switch from one order to the next by swiping up/down. You can also read some interesting facts about insects, as well as browse through macro photos and videos highlighting typical insect activities. For example, you can see how a White-tailed Skimmer would emerge from its old skin as an adult, and how the Western Honey Bee gathers nectar from flowers. 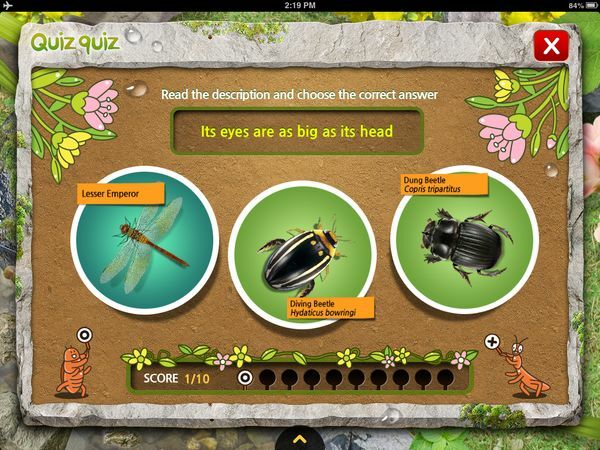 Similar to the other two apps in Meet the Insects series, the Water and Grass Edition also includes a journal and interactive quizzes. You can store your own photographic journals of insects inside the app, or test just how much you have learned about insects through this app. You can try either true/false questions or multiple choice questions. This version also supports a day/night view of the environment background. Simply tap on the sun/moon icon on the top right corner of the screen to toggle the entire theme of the app from day to night and vice versa. After the female Giant Water Bug lays her eggs near water plants, the male often comes out of the water to supply the eggs with water. The Dung Beetle is almost on the verge of extinction because cow dung these days does not have enough fiber. It’s because cows nowadays don’t eat grass. Wormlike parasites are natural enemies to the Mantises. They hide inside grasshoppers or locusts that the Mantis eats. Once the parasite gets inside the Mantis, it feeds off the Mantis’s internal organs and bones. Meet the Insects: Water and Grass Edition is a great follow-up to the first two editions of this encyclopedia series on Insects. These apps have high quality design and content so they really worth collecting. There is a vast of information available and the apps make learning them easy and fun. I highly recommend this app to any elementary-level students who are currently exploring the animal kingdom. Thank you to the wonderful team at NCSOFT for sharing the app with us. Ranger Rick’s Tree House. Interactive magazine wants kids to love nature. Solar Walk. A comprehensive and interactive app for learning about our solar systems. Bobo Explores Light. Highly informative and interactive app discusses the science of light.